After years of stalemate, Pennsylvania’s legislature finally passed Act 13, a series of amendments to the 1984 Oil and Gas Act to deal with the boom of hydraulic “fracking,” unconventional natural gas wells that release the precious energy resource trapped in the Marcellus Shale formation. What’s happening with this legislation and the new rules and regulations that will come from it is very much a moving target, and there’s a lot to cover when it comes to fracking, so this is the first of a four-part series. See part 2. Note that the law’s constitutionality was challenged and that in July, the Commonwealth Court found some parts of the law unconstitutional – the part that limited local governments’ ability to write ordinances to restrict drilling in certain areas as well as the part that expanded waiver allowances to the siting standards involved in permitting an unconventional gas well. The decision was appealed to the Supreme Court of PA, which heard testimony and arguments in October 2012, bu there’s been no indication of when a ruling will be forthcoming. In this first part, the focus will be on Act 13’s changes to permitting, notifications, bonding and reporting. A descriptive list of the chemical additives used. Companies may designate parts of the stimulation record as trade secrets or proprietary information, but PA’s Right to Know Law will still apply. Operators must also be prepared to divulge even proprietary information immediately and verbally to emergency responders who need in treating affected people. Proprietary information must also be divulged if any person or entity requests it in writing because they feel they have been affected by a spill. In addition, unconventional well operators must complete a chemical disclosure registry form for publication on FracFocus.org in addition to the above reporting to the DEP. This must be accomplished within 60 days of the completion of fracking. Permitting. The drilling permit application forms have been changed so that there are separate forms for conventional, unconventional and wells to be drilled in coal areas. There is an new form to describe ownership and control of companies seeking oil and gas well permits, as well as new bonding forms. All those may be found on the DEP’s Individual Forms page. The response rate of DEP to a permit application has been extended to as much as 75 days if the applicant is seeking a variance or waiver request on well siting restrictions. The DEP’s grounds for denying permits was expanded to include situations where the applicant, parent or subsidiary is in continuing violation of applicable state laws and regulations, or the applicant has failed to pay the required impact fee or file a report. Also note that a water management plan must be submitted and approved if any water will be withdrawn for drilling or facking stimulation of an unconventional gas well. Approval must be sought through the appropriate River Basin Commission (Susquehanna, Delaware River or Great Lakes). This is a condition for any permit to be issued by the DEP. The municipality in which the tract of land upon which the well to be drilled is located. Each municipality within 3,000 feet of the proposed unconventional vertical well bore. The municipalities adjacent to the well. Surface landowners and water purveyors with water supplies within 3,000 feet of a proposed unconventional well bore. Gas storage operators within 3,000 feet of the proposed unconventional vertical well bore. Note that “Adjacent municipalities” are all those that share a common border with the municipality in which the tract of land upon which the well to be drilled is located. Additionally, municipalities located within 3,000 feet of the proposed unconventional well bore must also receive notice of the plat by certified mail, whether or not they share a common border with the municipality where the well to be drilled is located. As you can see, Act 13 is far-reaching in its effects on unconventional gas wells in the state of Pennsylvania. Stay tuned for Part 2 of this series, which will look into the environmental protection and setback provisions of Act 13 that have changed. 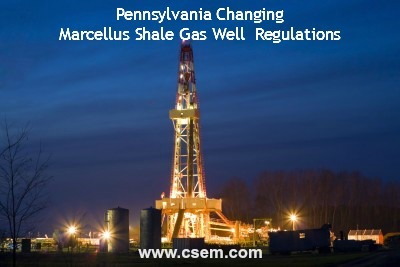 Click here to learn more about our Marcellus Shale safety training program.